The new Flint and Feather rules from Crucible Crush are focused upon skirmish combat between the peoples of the First Nation in what came to be called the Americas. These battles take place in the period well before the Europeans arrived, in a time known as the Heroic Age. It’s a blend of reality and the fantastical, as portrayed in the myths and legends which tell of the Great Warriors who are remembered in the oral traditions of the first people’s to dominate the wilds of a continent. Unlike other rulebooks, Flint and Feather begins with a set of Quick Start Rules, designed to introduce the gamer to the main rules mechanics from the outset. They work with a Quick Reference Sheet and two sample War Bands that may be found at the back of the rulebook. 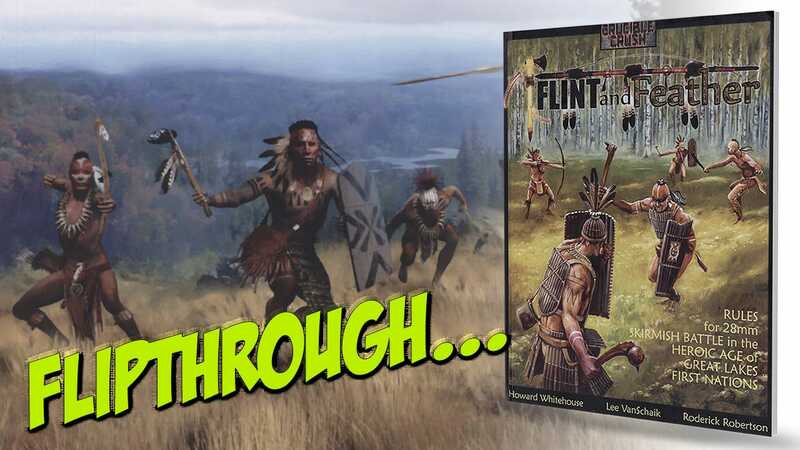 Here can be found examples of how to use each player’s two actions, the basics of shooting and close combat via the use of a figure’s Combat Value or CV, how character’s and groups move and finishes with a necessarily brief introduction to The Peoples of Flint and Feather, the various tribes, their tribal lands and a map. The indepth rules themselves are the next to be found, focused upon the creation of a War Band. A War Band consists of around 12 models, with more in a War Band with poor skills and fewer in a group with advanced skills. The game is built around the use of 28mm sized figures, and the ground scale reflects this. 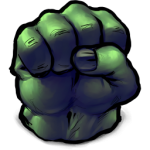 A useful glossary covers the main terms used in the game, including the main motivator of Orenda, or reputation, inner power, magic, which can increase or decrease during the course of a game or campaign. War Bands are built around a war chief, a Great Warrior, who takes to Heroic Warfare with a mixed force of Companions and Warriors of different abilities. You can also include Healers and Shaman to add an extra level of survivability or the magic of the spirit world. Each type of character is defined by the numbers allowed, the Furs they ‘cost’ (basic points) their potential abilities and how many Equipment Points they may spend. An abilities list is included, which may be chosen or assigned using a random die roll. There are also sample War Bands to aid the creation process. Included in the rules section are terrain suggestions and definitions, the use of Fur Markers that are used as goals in games, how Groups work alongside the main characters, encouraging the use of group activation at the expense of being able to move freely, rolling to activate, using Medicine Rolls and Cards to vary the gameplay, movement, shooting action resolution, close combat actions, the use of reactions, the allocation of Combat Value dice to Attack and Defence, options to make attack and defence maneuvers and a handy chart to find the combat results, and making morale or Nerve tests as a result of taking wounds or casualties. There is a comprehensive set of Campaign Rules for charting the progress of a War Band, such as the post-battle sequence, the effects of wounds, character progression through experience, and using the acquisition or loss of Orenda as the main way to ‘win’ a campaign. Orenda forms the basis of the ‘magic’ system, how a Shaman or other character may use this mystical energy as power to use spells of healing or attack, summon Spirit Creatures or Oki to aid the War band and a chapter on how the Natural and Otherworld Creatures of this Heroic Age work within the rules. There are 10 scenarios outlined towards the back of the book, 4 standalone and 6 designed to create a campaign narrative. These are fully detailed with maps, forces to be used, victory conditions and everything else needed. Some are simple ‘1-vs-1’ battles, whereas others deal with multi-War Band encounters. Finally, there are advanced and optional rules for using water-based movement via canoes, the effects of palisaded communities, a useful painting guide for miniatures, the afore-mentioned QRF, photocopiable attack and defence cards for close combat, medicine cards and sample and blank record sheets. This is a comprehensive and interesting set of rules, lavishly illustrated with artwork and painted examples of the Flint and Feather miniatures range, sculpted by ace sculptor Bob Murch and also available from Crucible Crush. The fundamentals of the game appear involved but simple to follow, and the War Band system, with the motivating factor of the Orenda, suits the idea of the honour-based battles associated with warfare amongst the tribes around the Great Lakes. The care and respect for the tribes themselves is evident in the approach to the game, and the game concept itself is original whilst using some familiar ideas.